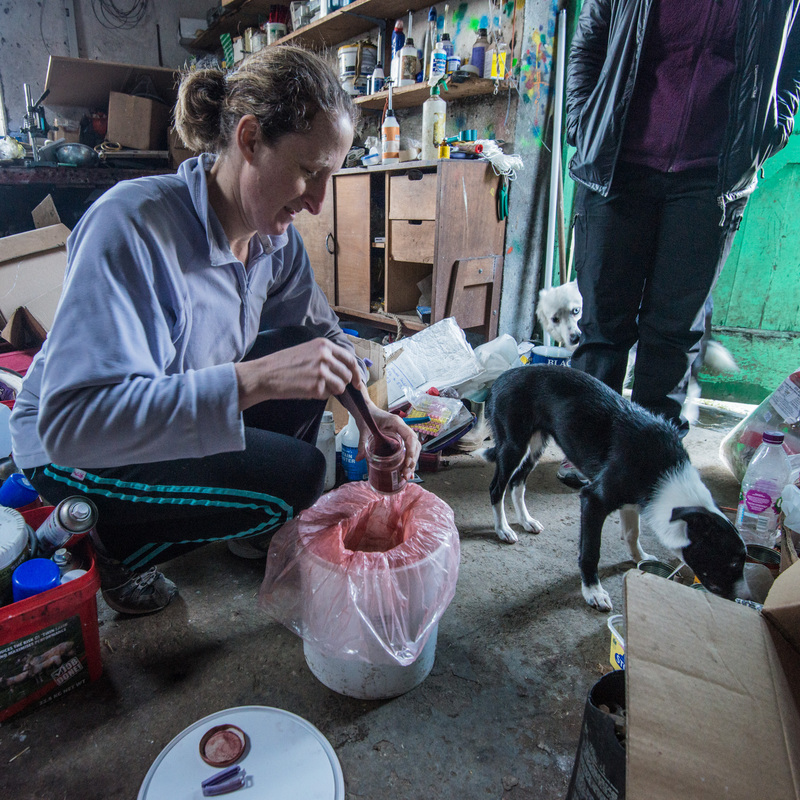 In Cumbria when Herdwick sheep are prepared for shows they are traditionally spruced up with ‘red’ – a powder that is thickened with oil and rubbed on their backs. The use of Show Red is a sign of pride and celebration and builds on a practice of marking sheep that dates back centuries. 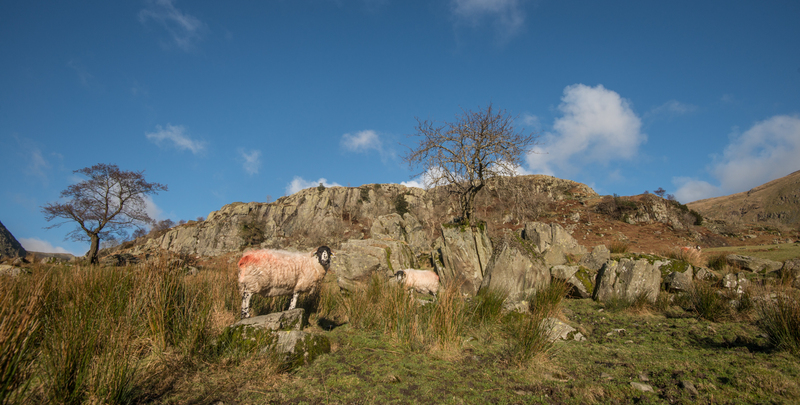 Every flock has its own smit mark, a line or pattern of colour on the fleece, and a single farm may have more than one mark depending on the extent of grazing land. In addition to this essential identifying mark, a rainbow of colours are applied through the year: they are like a code. At this time of year, colours are used to mark which ewes have been tupped, and which tup they’ve been to. Next month, they will be scanned and marked according to how many lambs they are carrying. 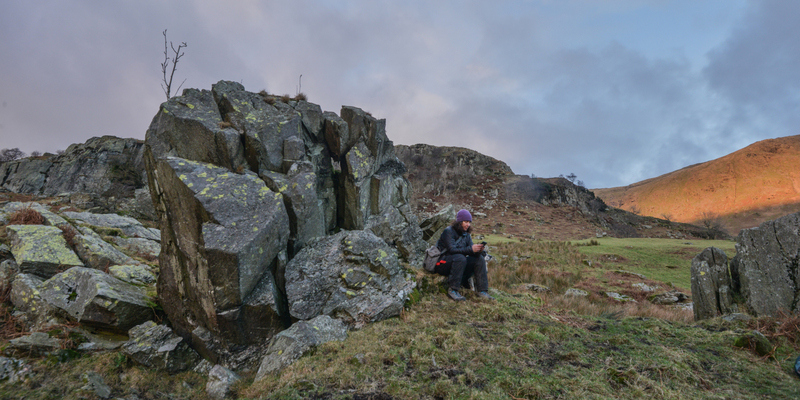 We have come to know the Kentmere Valley well over the last few years, but not only through our repeated walks to the Rowan that grows out of a split rock beneath the Tongue. We’ve also walked in the high fells on gathers with the Dickinsons, whose sheep graze on this side of the valley and on the commons that take in Kentmere Pike, Harter Fell and Nan Bield Pass. Our connection with this area is rooted in the many steps we have taken here and in what we have learned from the farmers. We have become familiar with the wide open fells, woodlands and individual trees, with the play of the river through seasons, the roll of clouds over the fell tops, the call of ravens and peregrines nesting in the sheer crags of the Tongue, and the year’s turning; and we’ve learnt a huge amount about what it is to farm here. Farming is an integral part of this landscape, and there have been people gradually taming the land in this valley since at least the fourth century AD. So for the addition of red as the colour transformation at the Rowan it was an obvious choice to use Show Red. Of all the trees, the Rowan is the reddest – the name ‘rowan’ derives from Norse, Danish and Germanic words for ‘redden’, and its berries offer a flush of bright red through September and October each year. In the Chakra system (read more about that here) the colour red is associated with the first or ‘root’ chakra; it is symbolic of being rooted, grounded and having strong foundations, with a sense of belonging and being in place. A strong root chakra symbolises connection and the nourishment that comes from the earth we all depend on and is the basis for a harmonious system. When roots are not strong, an entire system struggles; as it is for a tree that’s poorly rooted, or an entire ecosystem that has become harmed or degraded. This Kentmere Rowan has sent its own thick roots in search of earth down through the crevices of a rock that’s two metres high. 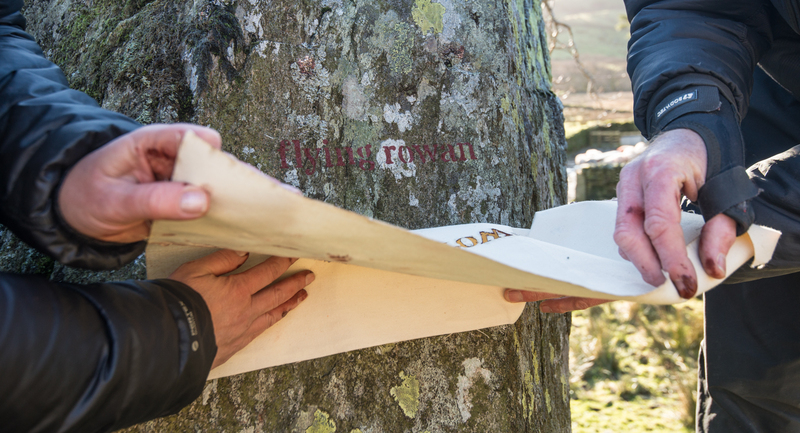 It is what’s known as a ‘flying rowan’, settled on rock rather than earth, and it is now well rooted and resilient, as are people who tend their sheep beneath its strong but delicate form. Hannah Dickinson spooning out some of the farm’s Herdwick Show Red for us to use. Now it’s New Year’s Day – the foundation for the year to come. It is cold but the air’s clarity is bringing out a deep and fresh blue in the sky after a day of rain. Where the Rowan grows there is a mound of earth and a small amphitheatre of split rocks. The sun is full on the rocks and there’s a cold wind blowing from the north. In the shelter of a rock I mix some of the Show Red with oil to find the right consistency for painting. 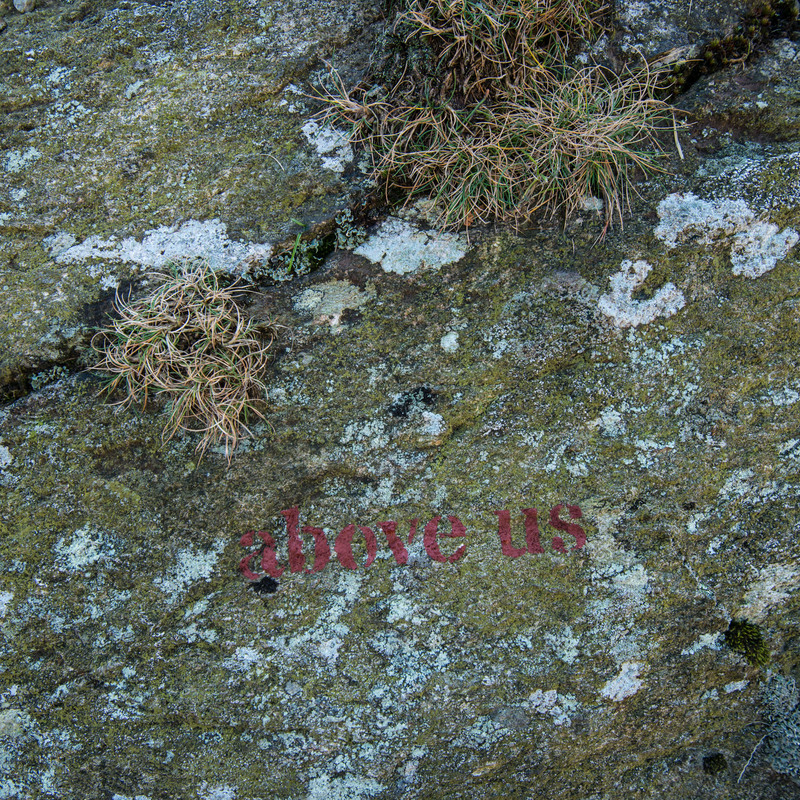 For the application of the red, we’ve had the words of a poem laser-cut into canvas. I lay the sheets out on a rock and turn the pages. Such is the angle and power of the sun today that it writes words for us in a way that we never expected – as I turn each cloth page there is a painting of light and a joining of words as the poem expresses itself. On the rocks, the words will last longer than these brief shows of light. We work carefully, Rob holding the canvas as flat as possible while the wind tries to tease it away, and me pasting Red against the stencil. The words ‘split rock’ are now red against the rock. We both feared the lettering would smudge but it’s crisp and clear. This act of poetry and art has become the foundation for the year ahead. There has been lengthy planning, care, precision and a happy coincidence of light and fair skies. My hands are red. Rob’s hands are red. And there is a simple poem on these rocks that is as red as autumn rowan berries and speaks, even though it will be here only temporarily, of the continuity of the elements that make up this landscape. The sun is still shining. The words are settling into rock and into this landscape, motionless as the rocks themselves. Words and rock and red, rooted in place and belonging and the cyclic passing of time, and in pride and affirmation of place. Tree and words and ourselves, on this sunny afternoon, well rooted, feet in the earth, steady as rocks, the sky above peppered with the sound of ravens, crows, buzzards and wind. And behind the rocks, a wren nagging at us to leave. Later, sleet blows down the valley and we are in a cloud of white dust. The sky’s play is a shifting spectrum of pinks and browns. We are once more in that magical twilight time that’s somewhere between light and dark, a series of moments hovering between definable colours. The scene loses its vividness but there’s a subtle glow that is all the more remarkable for its softness; it’s as if the sky is mirroring, in its own dusky hues, the lichen that’s on the rocks around me, and there is a joyful farewell in the final show of colours before grey takes over. The new year’s first day is passing with the earth’s tilt and the chilling of the air. I notice one last and unexpected coating of light on the fells behind me, a golden strike on dried bracken and grass. I am sitting with my back to the largest rock with the word ‘ravens’ above my head. I consider the short and simple poem that has distilled itself out of time and walking and sitting and watching and listening. It found itself. 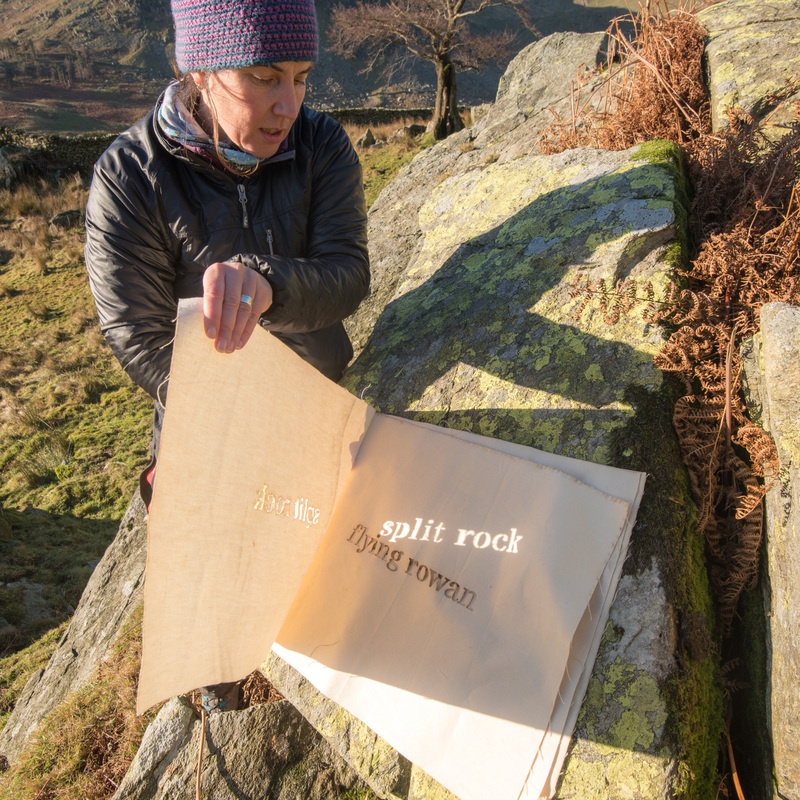 Over a number of months I had made many futile attempts at writing a poem for the rocks – but these seven words emerged of their own accord when I was walking in the valley in the autumn, not consciously thinking about the poem. Seven simple words that speak of the tree’s place and of our place, and now sit as simply and certainly as rocks beside the wintering rowan. We do not know how long they will last. The letters are small marks in a big landscape where the elements always, infallibly, have the upper hand. Enormous thanks to the Dickinson family for welcoming us in, for supplying the Red, and for helping us learn so much in Kentmere. And thank you to Simon Atwood and HighWire at Lancaster University for laser cutting the words into canvas.